I recently went to the store to purchase items for my upcoming home birth. The midwife will bring all of the medical stuff. I don't know if Walmart sells cord clamps. My list consists mostly of general household items like towels, sheets, and snacks. One of the items on the list was "2 bowls large enough for placenta". Do moms who deliver in a hospital usually get to see their placenta? No one offered this option to me after D'arcy's c-section. However, after Julian was born, Holly, my midwife, asked me if I intended to keep it or if I would prefer for her to dispose of it. Hmmm, let me see. No, I didn't have any plans to keep it. As a matter of fact, what does one keep a placenta for? I pictured using it as fertilizer for my non-existent garden. Friends come over for dinner and remark at how red my tomatoes are. I would proudly let them know that thanks to little baby's arrival, our garden got a little extra nourishment this year. Then our horrified friends would suddenly lose their appetite. My midwife explained that one of her clients saved the placenta to use as a science experiment for her home schooled kids. Maybe this is why the Duggers keep having kids. They need a fresh placenta each time an older child enters sixth grade. We let Holly know that we would greatly appreciate her disposing of it for us. After Schroeder's hurried delivery, Holly didn't repeat her question. 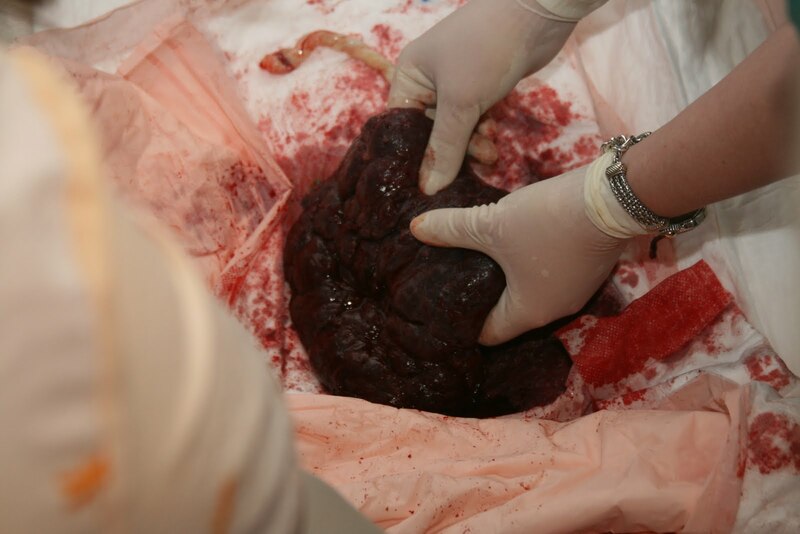 Our friend Joy who was taking pictures did, however, document the placenta so we would never forget it. This picture actually came in handy yesterday when I was trying to figure out what size bowls to purchase. I'm still not sure why I need two of them because as big as I am, I'm definitely NOT having twins. I laughed the whole way through this. Thanks for making my morning! I guess now I won't be surprised if that question gets tossed my way. I have to comment that the hands holding the placenta are Holly's, the white/yellow blur to the bottom left of the frame is the asst midwife (Jennifer I think? ), and what you can't see in the photo is that D'arcy is standing very nearby because they asked if she wanted to see the placenta and she was very interested. Also, you are brave to put the color version of this photo online! The only one I have posted or printed is the black and white! But hey, without a placenta, there is no baby! Yes, moms who deliver in hospitals get to see their placentas. My nurse asked me each time, so I got to see both of mine. It was actually quite facinating!